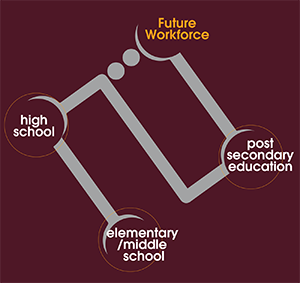 Developed by the Career Ready Berks Alliance, the K-12 Career Pathways Framework is designed as a systematic approach to ensure all students in Berks County access to information, resources, experiences, and training from kindergarten through grade 12 which will contribute to informed decision making and post-graduation success. Career Pathways from Communication Media Technology on Vimeo. A Career Pathways System (or initiative) operates at a local/community level, consisting of a partnership among employers and employer organizations, postsecondary colleges, universities and training providers, career technology centers, primary and secondary schools, workforce and economic development agencies, labor groups, and social service providers to offer a variety of Pathways Programs of Study for youth and adult learners. The Career Pathways System has defined expectations, processes, and policies to guide the development and delivery of Pathways Programs of Study, and clarifies the roles and responsibilities of all involved stakeholders.